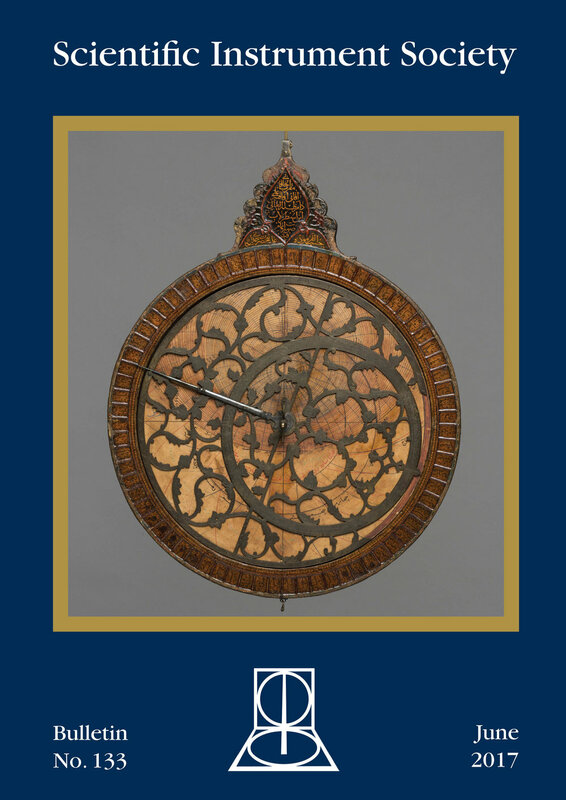 The March 2017 Bulletin features essays on Islamic globes, fake scientific instruments, Johannes Stoeffler’s celestial globe, and more. Selected articles from the December issue of the Bulletin are now available online. The issue features material on Giovanni Battista Amici, cloud chambers and kaleidoscopes, and the dust counter of John Aitken. Selected articles from the September issue of the Bulletin are now available online. The issue features material on Henry Sutton, the Dollond firm, and a newly discovered Leeuwenhoek microscope, and much else besides. Click here for more information. Bulletin No. 129, for June 2016, is out now, featuring articles on a telescope by Thomas Grubb at Armagh Observatory, the Klaxon, scientific jewels and much more. The table of contents and a selection of online articles are available here. The March 2016 issue of the Bulletin has arrived: see the contents and read selected articles here. The contents page of the Bulletin of the Scientific Instrument Society (Number 127: Dec 2015 issue) are now online. The contents page and our Editor's selection of articles from the Bulletin of the Scientific Instrument Society (Number 126- Sept 2015 issue) are now online.